Sail Europe's legendary rivers aboard the Viking Lfon and discover wondrous cities and hidden towns along the way. Unpack once and enjoy the quiet elegance of your floating hotel while experiencing the local culture and customs during this magical cruise. Start the day with a delicious breakfast in the restaurant with its floor-to-ceiling windows and panoramic views; take an excursion, embark on a guided walk, or simply explore on your own. Share stories with newfound friends, savor a glass of wine on the Aquavit Terrace, or simply relax on the Sun Deck as the world floats peacefully by. 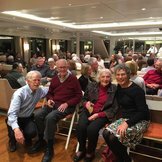 We truly enjoyed this Rhine cruise from the accommodations, to the staff, to the places we toured and the guides who helped us. It could not have been better. Viking did an excellent job, thanks. definitely seeing the windmills in Kinderdijk was my favorite excursion... I was a little disappointed in the wine tasting experience at our stop in Strasbourg, although the town was beautiful!! !